As a born and bred Melburnian it takes a bit of coaxing to get me across the NSW border. Maybe I won’t be moving there any time soon, but there’s also a lot to love about Sydney. If you’re curious just what’s worth the trek across state lines, here’s how you can spend 48 hours in Sydney. Quitting time! Get yourself out of the office early and onto a plane. The best thing about travelling within Australia is you can do it over a weekend with a short flight each way. There are two important things you should know about Sydney; 1- the traffic is terrible, 2- the public transport is worse. You won’t regret having a hire car for the duration of your stay (especially since tomorrow’s activity is much easier with one!). So, pick up your car near the airport and drive on down to your accommodation. It’s been a long week and you deserve a drink. Soak up some Sydney atmosphere and check off the bucket list with a visit to Circular Quay. Home to the Opera House and Sydney Harbour Bridge, it’s well worth a look under the stars. Check out the Darling Harbour website as there are fireworks shows and events running throughout the year. For a beverage with a view spend a night at the Opera Bar along the lower concourse. Grab yourself a seat near the water, a few tasty bar snacks and cheers to the good times ahead. As the night draws to a close you could always head to bed or you could take a look at Sydney’s party scene instead. The Argyle is a late-night venue walking distance from your current hotspot. Located across the harbour bridge in The Rocks, they’ll have you dancing till the early hours of the morning. Treat yourself to a sleep in after last night’s antics, but don’t waste the day away. Take a trip out to the Blue Mountains for a day of scenery and photo opportunities. It’s only a 2hr drive from the central city to one of the most popular towns of Katoomba. The drive should get you there around lunchtime which is perfect for a pit-stop to refuel and stretch your legs. Wander down to the Echo Point Lookout for a quick selfie then on to Katoomba St – the main strip – and take your pick from the many cafes. If you’re more into urban scenery then check out Street Art Walk. Just off the main strip, it’s Katoomba’s version of a Melbourne graffiti laneway. The best scenery takes a bit of effort to get to so don your activewear and let’s get stepping. 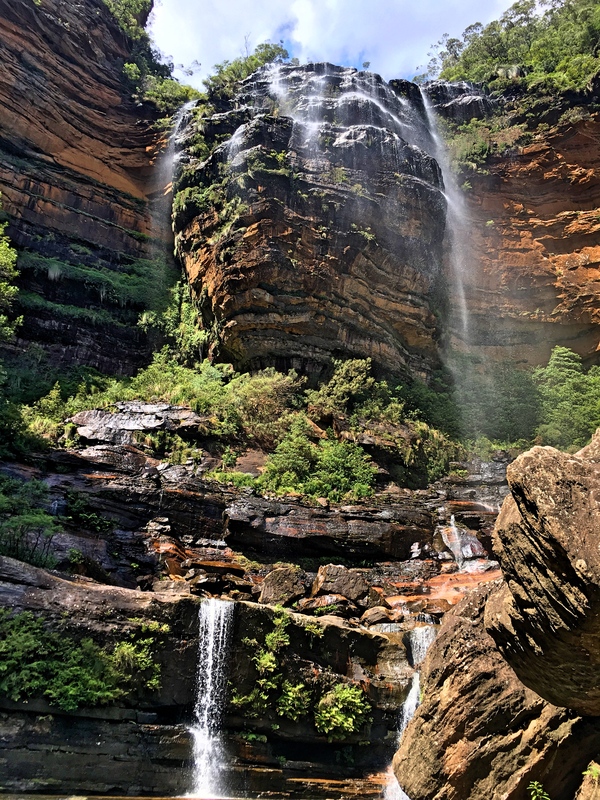 Less than half an hour from Katoomba, and back towards Sydney, you’ll find Wentworth Falls. The town and the waterfall are named the same so double check which one you’re locking in on the GPS. There’s more than one route to hike around the falls and they range from 1 hour to 3 hours return. You can get great views from the top of the waterfalls but I highly recommend trekking to the bottom. It’s mostly steep steps and they’re less forgiving on the way back up so don’t underestimate the time you’ll need to spend on a return trip to the base. Who said you had to skip the gym on holidays? With leg day complete and a tonne of great photos under your belt, it’s time to get back to relaxing. Drive yourself back to Sydney and enjoy another evening soaking up the city vibes. Feeling fancy? Treat yourself to a meal in Circular Quay and finish the evening with a night tour of the Sydney Observatory; operating at 8.30pm and 9pm most evenings. Feeling youthful? Newtown is the indie, university corner of Sydney’s city. It’s full of bars, restaurants and art from music to theatre. Head to King Street for some great food and research the dates you’ll be there to find out what performances are in store. Combining great food, markets and gardens all in one space; The Grounds of Alexandria is a self-proclaimed urban sanctuary perfect for your Sunday morning. It’s a seriously popular place to start your day so the best option is getting there early. Head first to the café to see if your group can get a table but don’t stress if you have to go on the waiting list. The gardens boast pop-up food stalls selling everything from cool drinks to organic honey. They’re also home to in-house pig Harry Trotter and his farm friends. Don’t forget a trip to the market shed with stalls of local wares. There’s still so much of Sydney on offer but so few hours remain. If you’re a beach bum then it’s hard to miss a trip to Bondi. Not up for the sand and surf? There’s always gardens and galleries instead. Fresh sea breezes and soft sand between your toes; it’s everything a beach should be. Soak up the holiday vibes with a lazy afternoon on Bondi Beach. If you’d like to explore the shore there’s everyone’s favourite photo opportunity looking out over Bondi Icebergs Club and pool. Further around the corner begins the famous Bondi-Coogee Coastal walk. The full trek is 6km long but no-one said you had to make it all the way there. The Royal Botanic Gardens are a sand-free way to fill your afternoon with sunshine and nature. Check out their website for a monthly round up of must-see plants in full bloom or download a map and make the most of your garden time. Save time for a visit to The Calyx with themed garden displays (their current exhibit showcases carnivorous plants), events and a small café. If the weather calls for an indoor adventure then I suggest the Art Gallery of NSW. It’s open 10am-5pm daily with free admission for most of the collection. There are typically paid exhibitions on offer as well but the free collections are more than sufficient for even your most artistic companions. For only 48hrs there’s been a lot packed in. You’ve feasted, partied, hiked and seen some of the best that Sydney has to offer. You were never going to conquer the whole city in such a short block but it’s safe to say you’ve put a dent in the Sydney bucket list. Fuel prices fluctuate like crazy! It can be a whole 10c different within a hundred metres. Unless you’re really low on petrol, hold out till you find a price worth your while. If you do go the public transport route instead of a car you’ll need an Opal card. They’re the only form of ticket accepted on buses which can get you around most of Sydney. The metro lines service the innermost suburbs and they have single trip tickets for $4.20 per trip as an adult. Sydney is well-known to be one of the world’s most expensive cities. A little research can go a long way in avoiding an overpriced meal or staying in the wrong suburb. That being said, a fun trip is a carefree one. Try to over-budget so you can make the most of whatever opportunities come your way. Keep up with all the 48hr itineraries here. Julia is a freelance writer from Melbourne specialising in content marketing and lifestyle articles. She’s usually busy planning new travel adventures or writing on past ones. If she could bring any two things to a deserted island they’d be a plane and a pilot. Check out more articles for a sense of her style or get in touch to collaborate.